France held the second round of its regional elections on 13 December. As Rainbow Murray writes, the key story to emerge from the election was the failure of the Front National to win in any of the French regions, following a strong showing in the first round of voting. She notes that while the second round will ultimately be regarded as a failure for the Front National, there remains little to celebrate for either the governing Socialist Party or Nicolas Sarkozy’s Republicans. On 6 December, France once more made headlines around the world as the far-right Front National (FN) topped the polls in the first round of the country’s regional elections. Its leader, Marine Le Pen, and her niece and member of parliament Marion Maréchal-Le Pen, both held commanding leads in their respective regions. Could it come to pass that a far-right party could wield executive power in two or more regions of France? In the end, the answer was no. On 13 December, the decisive second round left the FN empty-handed, while the right-wing Republicans and left-wing Socialists each clocked up modest victories. All three parties will take some comfort in their achievements while also feeling rather uneasy about the outcome. Note: Parties contest the regional elections in a variety of alliances. For ease of reference, only the largest party in the winning alliance (the Socialist Party in the case of the left and The Republicans in the case of the right) are shown in the table. In Corsica, the election was won by the regionalist coalition Femu a Corsica. In addition to the 13 regions shown there are also four territories located outside of Europe – French Guyana, Guadeloupe, La Réunion, and Martinique. Why did the FN fail to translate their first-round glory into second-round victory? The answer is at least threefold. First, the Socialists sacrificed a number of seats in the two regions where the Le Pens looked set to win, in order to throw all their votes to the Republican candidate. Had they remained in a three-way contest rather than standing down, the FN would have taken both regions. By lending their support to the mainstream right they managed to block out the far-right. This strategy was effective, but costly; they are now entirely absent from two councils they previously led. Second, there was a surge in turnout in the second round, with participation up 10 points compared to the first round. Disillusioned left-wing voters who stayed at home last week decided to put in an appearance for the second round to vote against the FN. This links to the third answer; the “toxic ceiling” effect of the FN led to a swell of anti-FN mobilisation to block them from gaining power. The FN may be embittered by this experience, but the mainstream parties have little to crow about either. They recognise that they need to give voters a reason to vote for them rather than simply to vote against the FN. 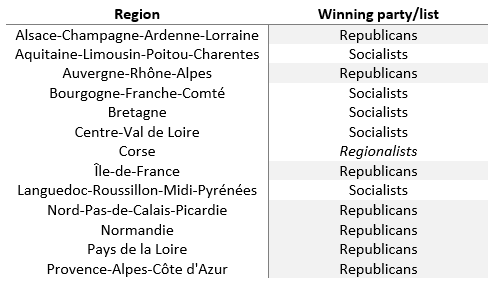 The Socialists held on to five out of twelve regions in mainland France, a respectable performance relative to their disastrous results in the other mid-term elections since Hollande’s victory in 2012. They only lost two more (Greater Paris and Normandy) by very small margins. But this still equates to a very significant loss of power, so they cannot celebrate this result; at best, they have evaded a whitewash by the right. Conversely, the Republicans achieved a rather modest victory of seven regions – and this figure would have fallen to five, with two going to the FN, had the Socialists not gifted them those regions to block the FN. In the context of a chronically unpopular president, the party of the opposition would surely have hoped to do better than this. They won three regions decisively, two by a whisker, and two with the help of their rivals – hardly a glittering victory. This leaves their leader, Nicolas Sarkozy, with some soul-searching to do. Sarkozy has long endorsed a strategy of appeasement towards the FN, seeking to win back their voters by adopting an ever more right-wing discourse. His surge towards the right has only served to legitimise the discourse of the FN and keep their favoured issues near the top of the agenda. Sarkozy’s gamble appears not to have paid off; the first-round results demonstrated clearly that he has done nothing to stem the tide of voters drifting towards the FN. This therefore weakens his position in the long run-up to next November’s party primaries, where the candidate will be selected for the 2017 presidential election. Sarkozy’s strongest rival, Alain Juppé, offers an alternative strategy of shifting the party back towards the centre-right. The lacklustre results under Sarkozy’s leadership will embolden those who reject the strategy of wooing the far-right and are keen to give Juppé a try. The muted tones of Sarkozy’s victory speech were a tacit acknowledgement of the uphill battle that lies ahead of him. Elsewhere, with all eyes on the FN and the counter-attack by the mainstream parties, no-one noticed a different storm brewing down in Corsica. Here, the region has been won for the first time by Corsican nationalists. This will create another thorn in the side of the government that they could surely do without. Overall, everyone will put a brave face on the outcome, but the underlying message is that France remains in a period of relative instability. Both mainstream parties are struggling, and their tactics to counter the FN have proven to be costly for the Socialists and ineffective for the Republicans. They might take some scant comfort in knowing that the outcome could have been worse, but they also know that they could and should have done better. The real challenge ahead lies in the 2017 presidential election. The Socialists still run a high risk of wipeout in the first round, with Le Pen facing off against the Republican candidate in the second round. The Socialists have an enormous uphill battle ahead of them if they wish to avoid this scenario. The continued surge in popularity of the far-right means that the traditional left-right stand-off in the second round of the presidential election risks becoming a thing of the past, and this will dramatically change the landscape of French politics. If Le Pen does qualify for the second round, she stands little chance of winning, because her polarising discourse repels even more voters than it attracts. All eyes will therefore be on the Republican primary, because whoever wins that will most likely be France’s next president.